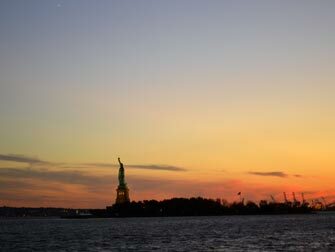 Not too long, not too short, the 90-minute Twilight Boat Tour is great for preparing you for a night out in the city. After shopping or sightseeing, prepare to see the Manhattan skyline from a different perspective – and learn a thing or two from the licensed guides. 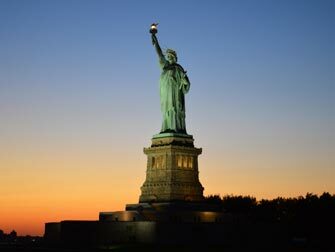 If you are lucky, your tour will have the perfect combination of romance (at sunset) and awe (seeing the lights of Manhattan slowly turn on). You’ll see the city like never before and won’t easily forget the impression it leaves on you. The tour leaves from Pier 78, which can be a little hard to find so make sure you have a map with you or take a taxi. From Pier 78 you’ll travel around the tip of Manhattan up to the United Nations Building, passing iconic buildings such as the Empire State and Chrysler buildings. You then head a back to see the Statue of Liberty – the boat will get you a lot closer to her than the free Staten Island Ferry! There you will have ample time and opportunity to take photographs. If you feel like it, you can grab a beer inside, and for $5 they are reasonably priced, and nice and cold.